Today was an early boot camp day for me. I needed it to change my sour attitude from last night. I know, I made it five days in to the New Year with a positive outlook and then, out of nowhere, it turned bad. I was tired, irritated by things I have no control over, whacked my knee on a metal chair in the dark (I blame the illustrator's obsession with chairs for this one)...so, I woke up this morning to change it. I don't know if having a positive outlook really changes the outcome of things, but I am trying to learn the art of not letting things I can't control...control my mood. Does that make sense? Do you feel like your attitude will actually change the way you feel about something? I don't know, but I am trying really hard at it. I do feel like my mood effects others around me though, so...positive feelings today! Now, for my apologies...I was wrong...I can admit that. 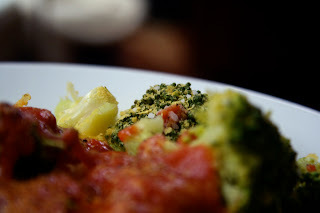 I have recently fallen in love with something I feared for a long time...nutritional yeast. I know I have mentioned it before, but I had a really bad experience with nutritional yeast a couple of years ago. Since then I was afraid to go there again. To this day, I question if the product was bad. I was told by others that Red Star was the best, so when I saw it, I grabbed a bottle in hopes that I could discover all that is great with this stuff. I was told by a nutritionist recently that it takes introducing yourself to something 7 times before you can establish wether or not you truly like it or not...no, I still do not like avocados. 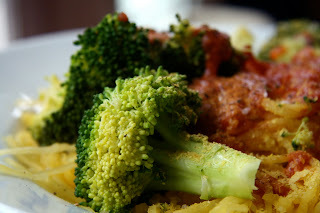 Nutritional yeast, however, I LOVE! I have started sprinkling this stuff on anything that stands still long enough. The illustrator better watch out! 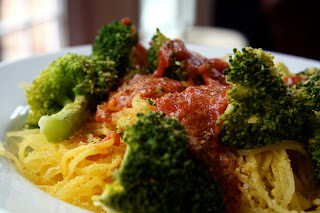 I haven't been in a salad mood lately since it is so cold (and the seasonal vegetable challenge has begun), so I am basically doing hot salads with vegetable bases to stay warm (aka spaghetti squash with steamed broccoli and some red sauce topped with salty goodness). I love the salty tang nutritional yeast and kosher salt gives veggies. It seriously is reminiscent of parmesan cheese! Not only is it tasty, it is high in protein and B vitamins! So, ya gotta love the tasty cheesy stuff...especially when you can't have cheese! As I mentioned before, we are eating seasonally. So, I am working on some meal ideas for us. I went to the store and grabbed a bag of kale and a bag of turnip greens. I was going to get them anyway because I am dying to try them in other recipes since I had them and loved them on New Years day (did I mention I will be rolling in money this year due to my consumption of greens that day...I am not superstitious, but I am going to believe that one!). I have childhood fears of collards, but I plan to revisit that soon too! Do you have a bad memory of a food that you have now overcome? What made you decide to try it again? I don't remember how it happened but I had mushrooms on something about a year and a half ago and now I love them! I put them in/on everything reasonable! Girl I am so there with you on needing to learn that too about things unable to control controlling my mood. I am so bad about letting that happen. I have seriously been craving spaghetti squash lately so this looks so incredible to me right about now. Just fresh, clean, healthy. That all makes perfect sense to me! One of my favorite quotes is something along the lines of you can't control what goes on in life, but you can control how you react to it. And hey, its normal to have to fight to make the changes we hope to see. You're doing awesome! I have aspirations of learning to like mushrooms and eggplant but not strong enough to actually try them again. I think it makes SUCH a difference...but it's really hard for me to do, too! I totally let things like weather, computer problems, etc. affect my mood, even though I know I shouldn't. I'm a HUGE fan of nutritional yeast! I love nutritional yeast. I could eat it with a spoon. I still have a lingering food aversion to BBQ ribs. I ate them once almost 8 years ago and got a stomach bug afterward and have never looked back. I'm 50/50 on nutritional yeast, don't love it and don't hate it. The one food I've warmed up to over the years is the avocado. I hated them when I was a kid and now they're one of my most favorite foods! Is it weird to tell you taht I love you even more knowing that you're not an avocado fan either? haha, probably - but I did. I've never been a fan and sometimes I feel like the only one!! I never knew you don't care for them, too. I *hated* garlic as a kid. I think only because it looked like an onion (sort of? ), and I hated onions. I would shun garlic bread, oh how stupid I was. I think I was finally tricked into eating garlic, and only then realized how awesome it was. I still loath onions, but garlic is my BFF. Same thing happened to me with Nutritional Yeast! I bought it last year and hated it....then it sat in my fridge for a very long time till I threw it out. Just a month ago, I tried it again, and now I think it's just super great! I put it in pesto and on my spaghetti squash (and in salad, and in smoothies...). I think the attitude thing is huge...I have training in mind-body skills, and I've seen pivoting one's thoughts (re-wording or re-framing) change people's lives! Nutritional yeast has such a strong bold flavor that I imagine a bad batch could definitely be the cause of your initial distaste! I had a traumatic experience with beets when I was younger and now I find it really hard to eat them even though they always look so good! nooch is so one of my favorite foods now (especially after reading your blog!! haha) but i never thought to add it to spaghetti squash!! i always find if I look for the positive in situations then it doesnt seem as bad. some things we just can't control. i love nooch! it took a few times before I went from meh to LOVE. And my tolerance is wayyyy up. Like i could put 1/4 c on popcorn and not even notice. It used to be a scant 1 tbsp was " alot ". Glad you love the nooch now! I don't know if I believe in the power of positive thinking, but I do think that a change in attitude works - at least not dwelling on the bad. Anyway, this looks yummy. I have nutritional yeast in my fridge and it's been there for awhile. I'm scared of it. Maybe I'll try it now. I like to think a positive attitude has a strong effect on what can happen. I used to hate chunks of tomatoes in my sauce-now I love it...weird how things change. I used to also hate any vegetable that wasn't corn or white potatoes and now all I survive on are any veggie you throw at me! I used to hate goat cheese and now I love it! Not sure how that happened, but I'm glad it did. I had a REALLY bad falafel experience in college and couldn't eat it for years after wards. My brother used to live right next door to the place that is actually in guidebooks as the best falafel in the world so I HAD to try it. Now, it was pretty good, but I haven't eaten it since then! It took me three tries to like nutritional yeast, but being in the Adventist church, it's usually on the popcorn :) I now love it on popcorn, stuck on with some flax seed oil. I also love my melty cheese recipe. Growing up I didn't like avocados, I thought they were slimy nasty things, but then one day I tried one again, and I've liked them since. Good thing though, that was a month before I spend 8 months in Mexico, and they use a *ton* of avocado. I still can not stand cucumbers, for no reason I can figure out, though I do eat them, because they're good for me :) I'm also leery of eating oranges, from a childhood experience with a batch of dry ones, and it took me years to relearn to like almonds after eating a rotten one. It's amazing how one bad experience can make the thought of eating something, even something you had previously enjoyed, physically nauseating. I really loathed avocado's as a kid. Mum kept making me try them. Over time I adapted. Then I absolutely LOVED them (especially grilled with melted cheese on top!). Then somehow I became allergic to them and now I miss them terribly :( (probably payback for all those years of not eating them :P). Pea's and green beans however have been on the hate list my entire life and will remain there for the rest of it.